Here at The Male Stylist we think the right dive watch complements casual and business wear and you just might get away with one with your dinner jacket! Here are some that we really like. Yet again our ‘go to’ choice comes from Christopher Ward and their C60 Trident range comes in two sizes, 38mm and 42mm diameter and starts at £599 with a leather or rubber strap for a mechanical version or, if you really must, a quartz movement at £399. One look at the extensive Trident range simply confirms the enduring popularity of divers style watch. 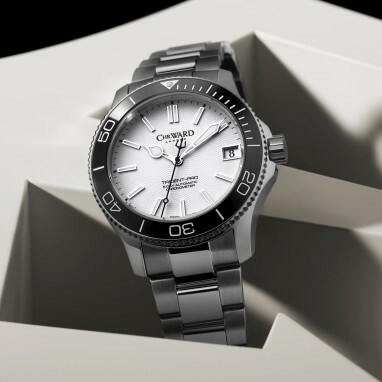 CW have just announced a new, top of the range C60 Trident 600 COSC version (shown below) which uses the in-house SH 21 120 hour automatic movement we have featured before. Combined with a ceramic bezel (just like its more expensive competitors), steel bracelet, and with the brand’s famous five year warranty, this looks stunning and has to be a watch bargain – if you have the £1650! We haven’t had any wrist time with this particular one yet (it’s not out until the end of February) but have tried others in the C60 range and every case, three words say it all: Quality, style and price! Our second choice is a very personal one, because it is our own Man About Time’s daily wearer. The Tudor Pelagos is a brushed titanium cased watch available on NATO strap, rubber dive strap with an extension supplied (just in case you really do want to go scuba diving) or the most technically interesting titanium bracelet on the market. Honestly, you can bore people for hours. As ‘divers’ go it is understated and purposeful so, if that fits with your style, it is well worth a look. Tudor made a welcome reappearance on the UK market in September, after a long absence, and have quickly become re-established. What a lot of people don’t know is that Tudor are the sister brand of Rolex and all of the engineering expertise that goes into Rolex’s dive watches is available at around half the price at £2840 RRP. Of course the automatic movement is basically the same ETA movement that Christopher Ward uses in many of its products rather than Rolex’s own in house masterpiece but, all the same, we love it! Which brings us, almost inevitably, to the Rolex Submariner. 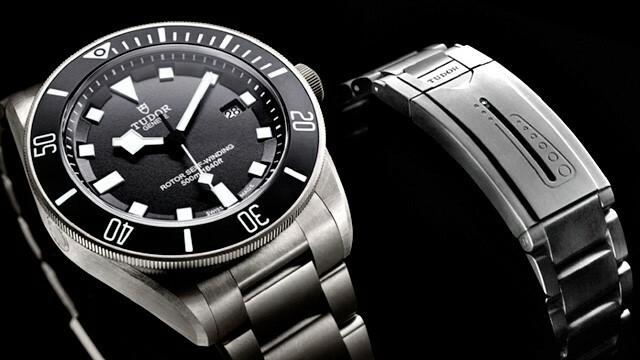 You simply cannot write an article on dive watches without mentioning Rolex’s Submariner range. Rolex’s reputation for water resistant watches begins with the cross channel swim of Mercedes Glietz in 1927, wearing a Rolex Oyster and culminates with film director James Cameron taking a Rolex Deepsea Challenge seven miles deep under the Pacific Ocean –strapped to the outside of his submersible! 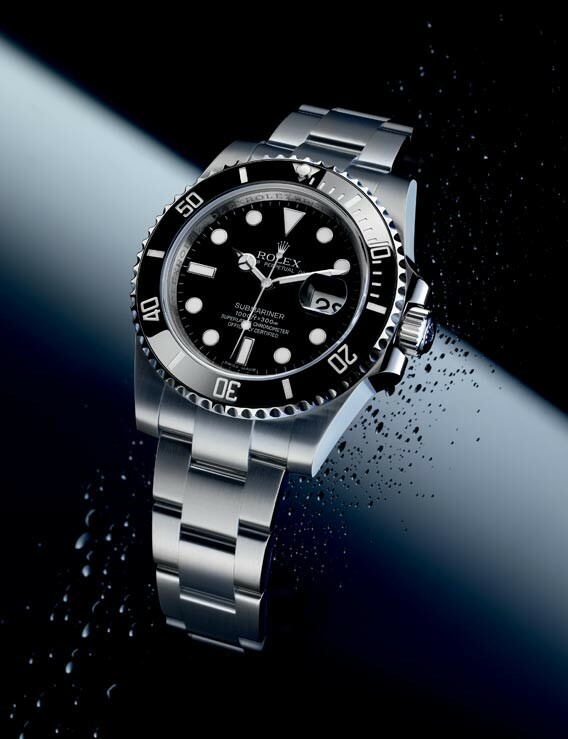 There is a reason that the design of the Rolex Submariner is plagiarised by others and why it is probably the most faked watch in the world; whilst not for everyone its impeccable engineering and build quality, combined with its heritage give it a style all of its own and ensures that, since 1953, it is the divers watch by which all other are measured. One other notable feature is that, over time, Rolex Subs have kept their value extraordinarily well and owners have basked in the warm glow of low depreciation, or even, with certain models, an appreciating asset. Increased in size a few years ago to 40mm The Rolex Submariner Date, with its distinctive ‘Cyclops’ magnifier over the date window may be popular but will never ‘common’. Hardly surprising with an RRP north of £5700! One genuine style hint: If by some chance you win the lottery, or a long lost relative remembers you in their will, and you find yourself sufficiently ‘in funds’ to buy a gold Submariner – Don’t! Having brought up the Rolex we almost inevitably need to talk about Omega. Always a premium brand, of recent years Omega seem to have decided to try to push their prices northwards and into Rolex territory. 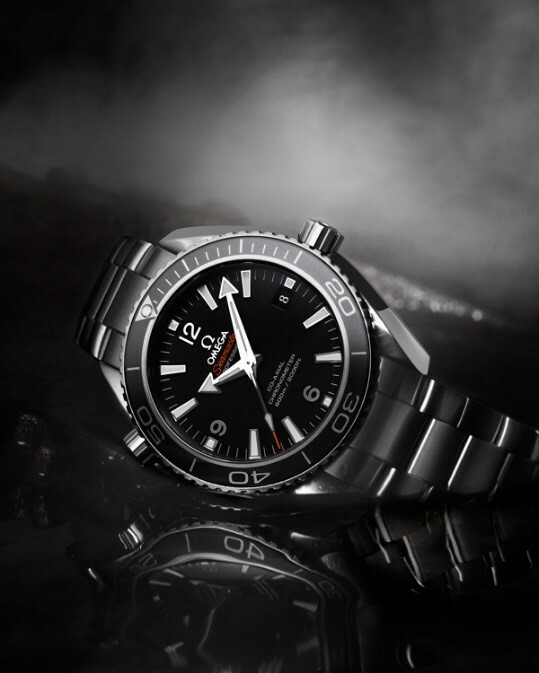 Their Seamaster Planet Ocean range of dive watches with their visible co-axial movements (and long service intervals) is quite stunning and their association with Daniel Craig’s Bond hasn’t done the PO’s image any harm at all. They come in two sizes at 42mm and a daunting 45mm diameter and also have quite the most beautiful rubber straps on the market, though if you are thinking of actually buying a new one (that will be around £3950 of your hard earned pounds thank you very much ) then please avoid the actual James Bond film tie in versions unless you really do want to look like a fan! Opinions around the office are divided on the PO’s external helium escape valve (Don’t worry; if you need to ask what it is for, you really won’t ever need the answer.) on the top left of the case but no-one regards Omega’s diver as anything other than a handsome piece. So that’s it. A whistle stop tour of some of the most stylish dive watches. All we need now is to work out how to buy one and still have the money left to actually get to the beach!